When viewing these photos, please know that this has been and continues to be a very abnormal year and it is very rare that we face this many issues in a single season, let alone all at the same time. Measures have been taken to address all of these issues. With time and careful management, all of these symptoms will eventually be suppressed. Physiological Decline (yellowing and thinning of turf) of Annual Bluegrass (Poa annua) in #18 fairway due to extreme heat and moisture. 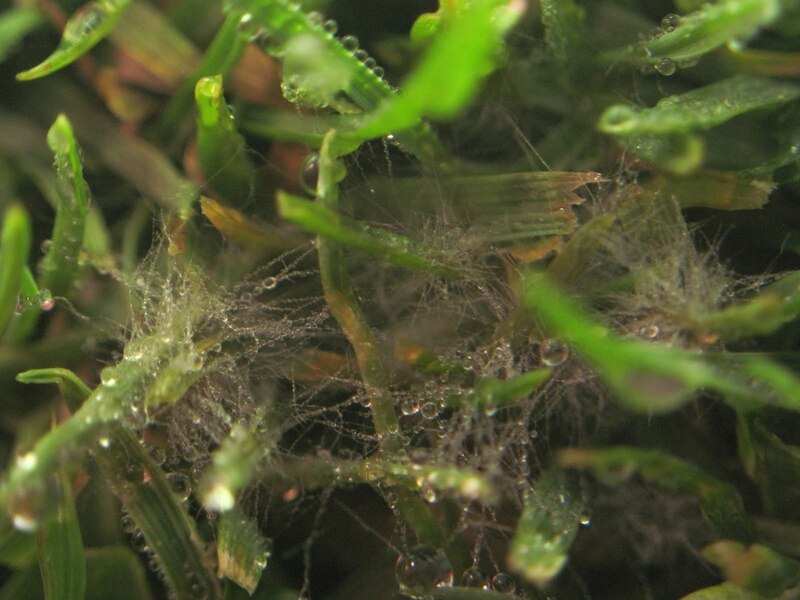 Dormant Roughstalk Bluegrass (Poa trivialis). 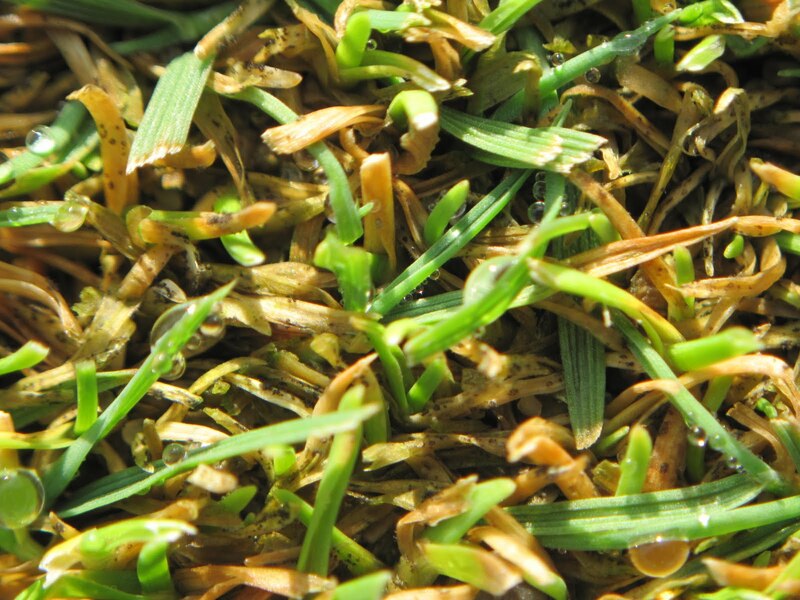 Turf still contains healthy stolons and if left in current state would recover, but not until next season. 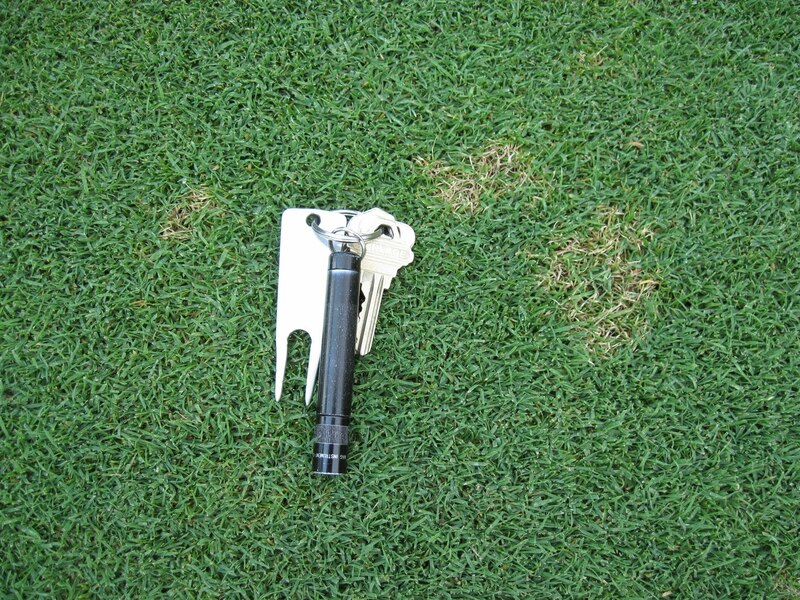 Localized Dry Spots (LDS). Notice the proximity and difference in moisture between the two samples. Despite the fact that we have a fan, we still continue to have thin turf on sections of #12 green due to poor air circulation. 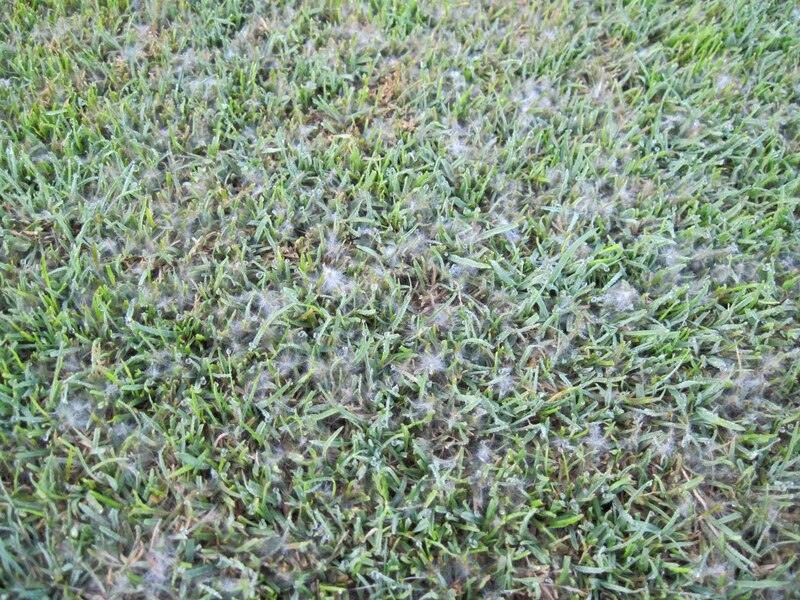 The end result of Pythium in #18 fairway, as well some other smaller areas. Turf dies in a matter of hours once infected. 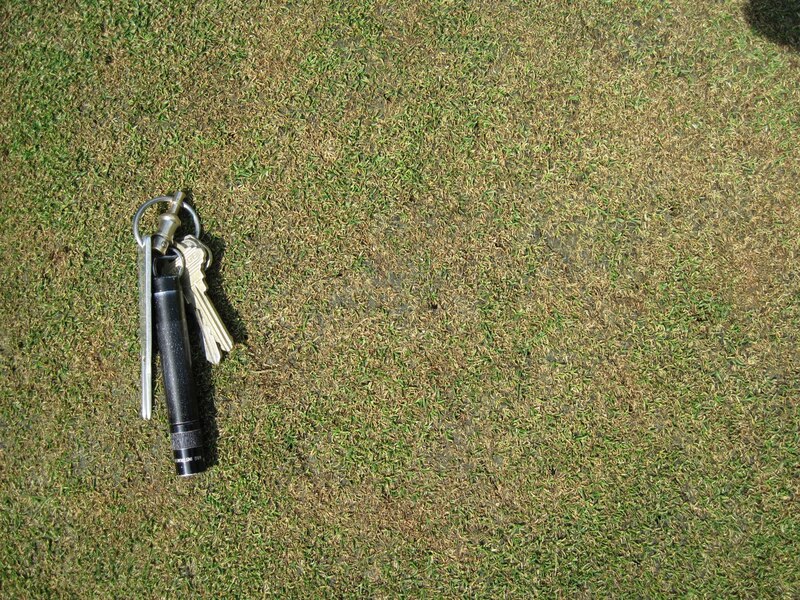 Brown patch can be found on several tees. Summer Patch (as well as a very poorly repaird ballmark) on #14 green. 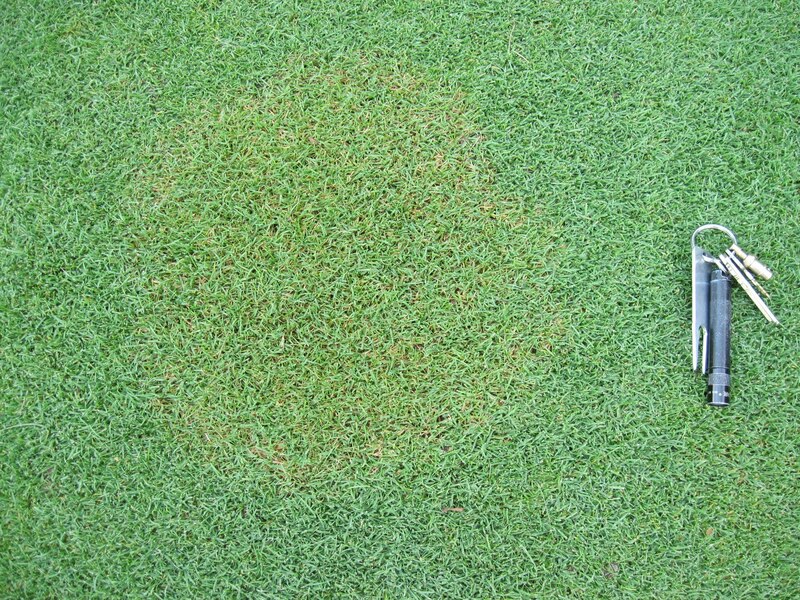 This disease can also be found on several other greens. Anthracnose on #16 green. It can also bee seen on #2, 3, 12 and 15 greens. Dollar spot from #6 tee. This is very common and small areas can bee seen throughout the golf course from the tees to the rough. I realize that the course updates are starting to be published quite frequently now, and I also realize that this is going to sound like a broken record, but feel it is extremely important to communicate with the membership what is happening on the golf course. Due to the extreme heat and humidity that we have been receiving for the last week or so, we are starting to see signs of stress caused by heat and disease throughout the golf course. 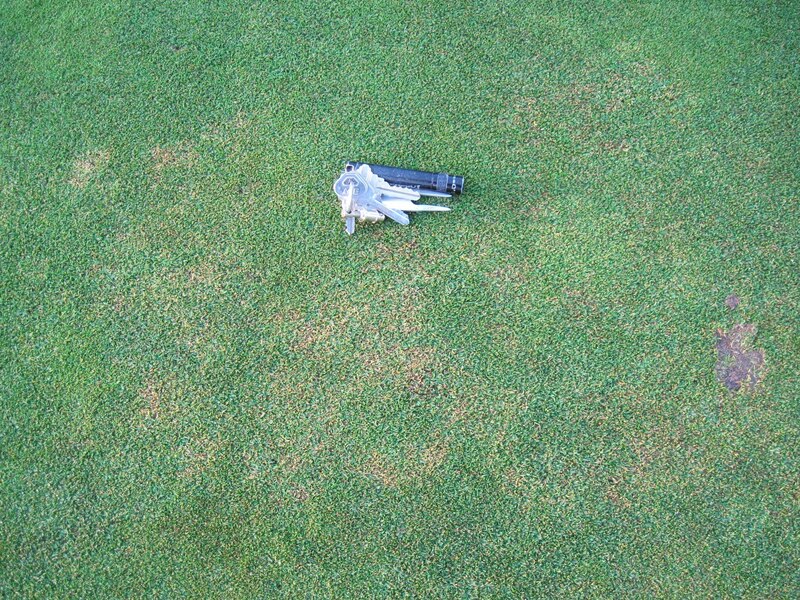 Within the last day we have seen a few different diseases appear on our fairways, tees and intermediate rough. 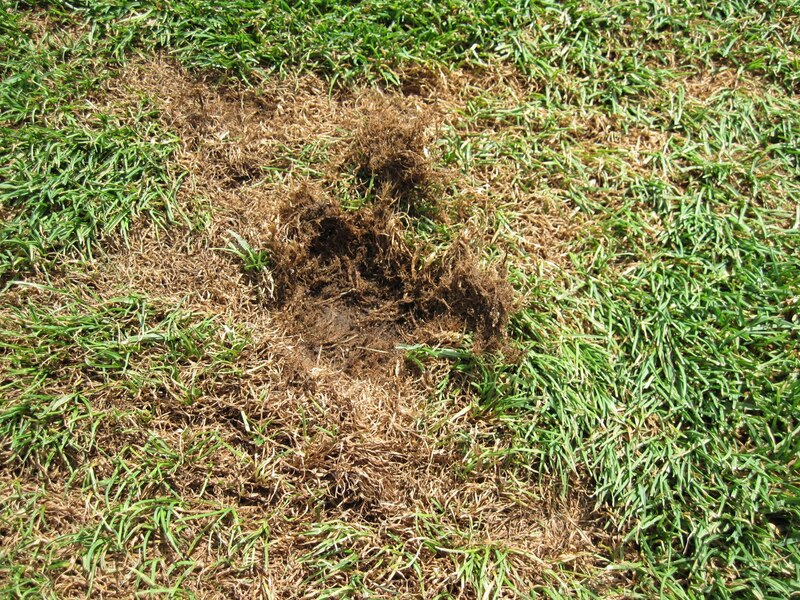 Because of the nature of one of these diseases in particular, we now need to take a more aggressive approach in protecting the turf throughout the golf course. On 7/22 all of the fairways and greens will be sprayed with a fungicide to better protect against further disease development. As of today, we are planning on spraying the tees on 7/23 before play goes off the first tee in the morning. All of these areas have been sprayed preventatively within the last week or two, but due to the severe conditions some breakthrough in the coverage has occurred. Hence, the need for additional applications. ﻿﻿An additional change in our current management practices will be the alternating of mowing and rolling the greens. At least for the next few days, greens will be rolled one day and mown the next. This will allow for some additional leaf growth which will help the plant better defend itself against stressful conditions. Please keep in mind that these changes are only intended to be temporary and that the ultimate goal is to provide you with a golf course that you can be proud of during the Walter O. Wells Invitational as well as the rest of the year. With that being said, until the heat and humidity begin to drop, we will continue to play defense. As always, I encourage all of you to please contact me with any questions or concerns. 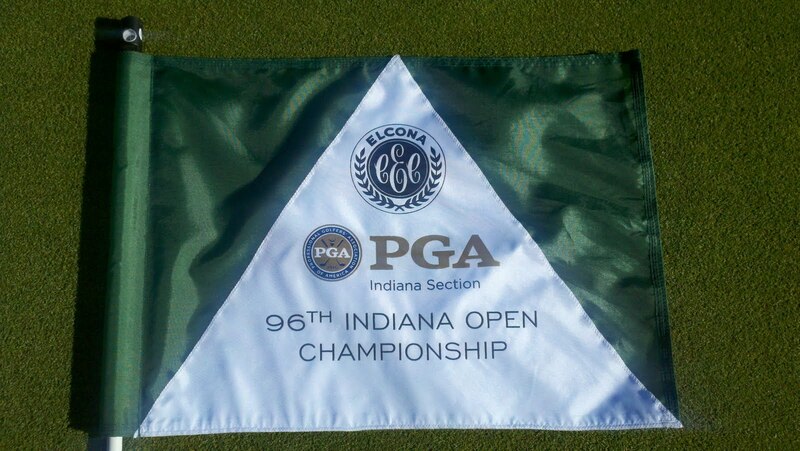 On Monday, 7/18, all of the greens on the golf course were vented. 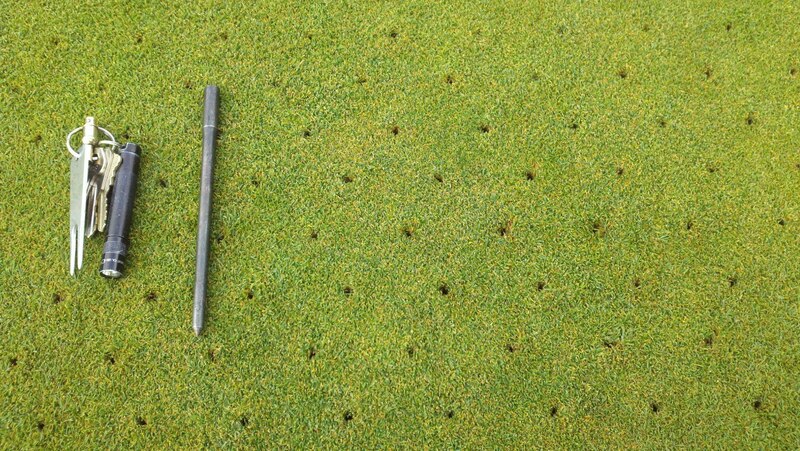 Venting is a form of aerification, where numerous tiny channels (1/4″ wide x 5″ deep) are created within the soil profile (rootzone) of the putting surface. There are several benefits to performing this practice. The channels help to ease the process of gas exchange within the soil allowing potentially harmfull Carbon Dioxide to be exchanged for Oxygen. During periods of warm, humid and wet weather like we have had and are currently having, it is crucial for us to be able to let the turf “breathe” and allow excess water to drain more quickly. The end result is a healthier stand of turf that can better tolerate the harsh summer conditions. With the weather we have had so far this week and looking ahead to the weather that is being forcasted for the next five days or so, this practice will prove to be extremely beneficial. More on the weather and how it affects the turf will be discussed in a blog post later this week. 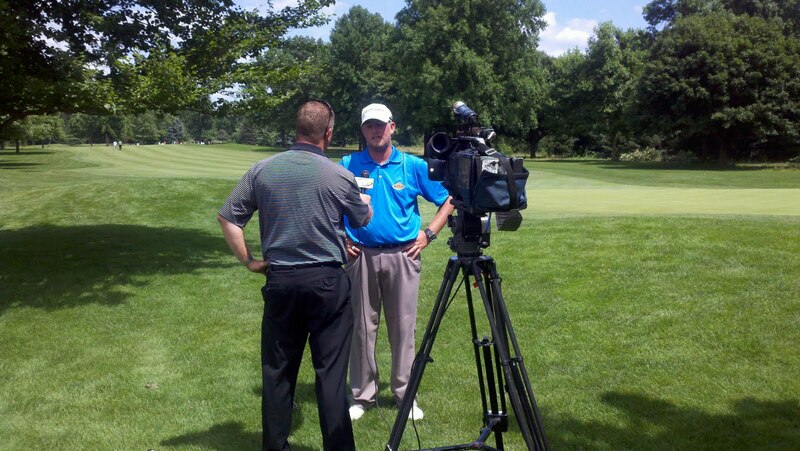 I hope that everyone was able to make it out to the club this week to enjoy watching some fantastic golf. I couldn’t be happier with the condition of the golf course and I feel that it put up a pretty good fight for the best golfers in the state. My staff has worked extremely hard, not just during the tournament, but, in the last day or so to get the rough mown, divots filled and debris picked up all before you get back on the course today (7/15). I would like to thank each one of them for their long days and dedication to Elcona as well as their desire in wanting to showcase the club during a very important week. With that being said, the course is now ready for a break before we head into Invitational week. Looking ahead to the forecast for the weekend and into next week, it appears that we are headed for an extremely warm and humid stretch of weather. Last year, about this same time, we had a similar weather pattern that contributed to an outbreak of Anthracnose on the greens. Because there is already some slight damage from Anthracnose on a few of the greens, we are going to be extremely cautious as we head into warmer and more humid weather. Unlike last year, we are currently planning to mow at the same height, but our rolling frequency will be reduced. We have also skipped an application of our growth regulator in order to promote some additional growth and speed the recovery process after a long week. At this point, there is no reason to panic. We are merely taking a proactive approach toward protecting the greens so that we can be ready to showcase the club for the 50th anniversary of the Walter O. Wells Invitational. 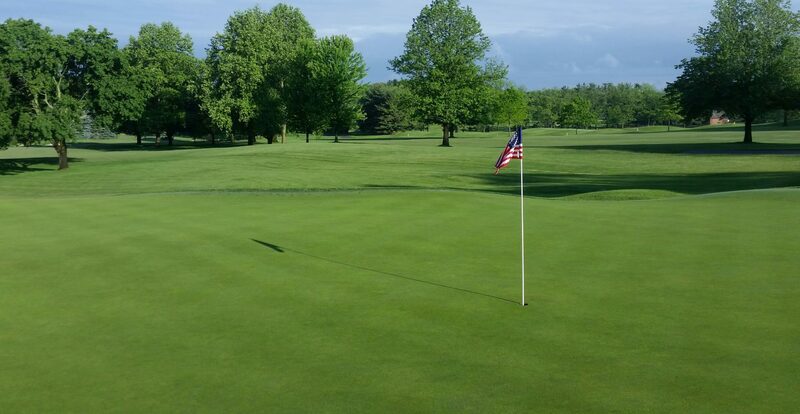 On Monday (7/18) the golf course will be closed so that a planned venting and topdressing of the greens can be done. This has been done once already this year and has paid huge dividends with respect to the overall health and playability of the greens. More on venting in a future blog post. Stay tuned! 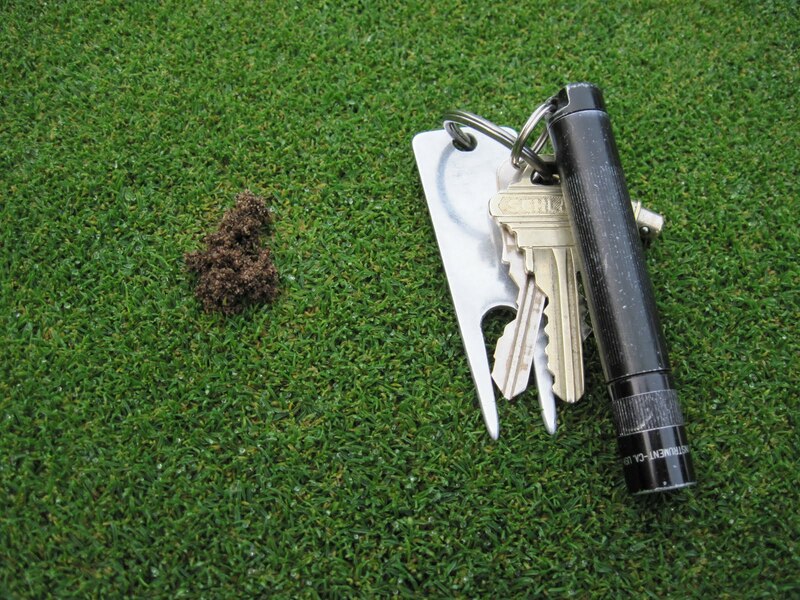 What’s Burrowing in the Greens? Throughout the month of June and into the early part of July, you may have seen small mounds of sand on the greens as shown in the photo below. These mounds are caused by a Seed Corn Beetle that is usually present around the course during the cooler and wetter times of the year (this year in particular). 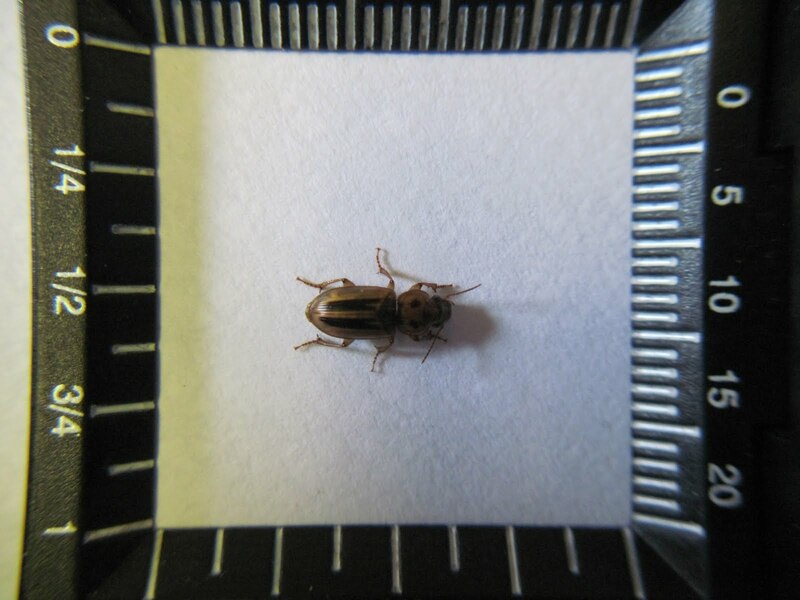 According to Entomologists at Purdue University, corn seed is not the primary food source for seed corn beetles. Rather, they feed on other things that they find in the soil, including other insects. We also know that they are highly attracted to and fly to lights at night. There are two generations per year, typically occurring in May/June and again in August. Generally, treatments are not necessary because the damage is not severe and we also try to set a rather high threshold for situations like this. The goal is to only treat when necessary to keep costs down and to reduce our impact on the environment. In order to find out exactly what is causing the damage, a section of the turf about 2″ deep must be removed where the mounding is. By tearing the turf where the burrowing channel is, the beetle can be exposed and then identified. 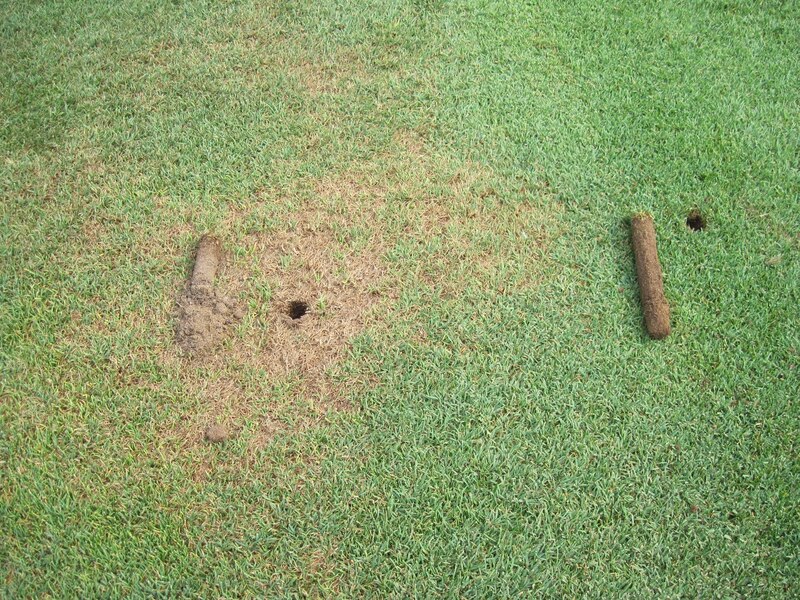 On the positive side, the channeling caused by Seed Corn Beetle can mimic the effect of aerification, which, in turn, can lead to better root growth and a healthier stand of turf. Who could argue with that? Plus, the labor is free! 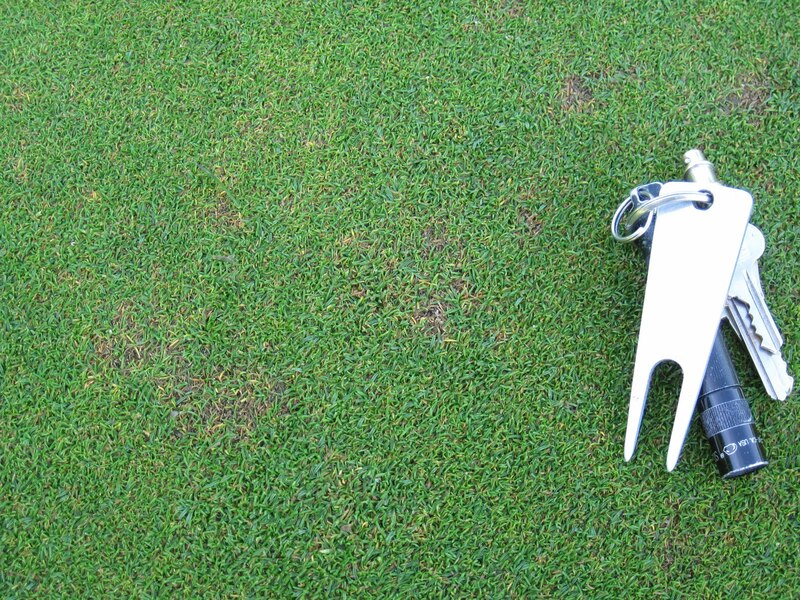 Unlike Dollar Spot, Foliar Anthracnose (fungal pathogen Colletotrichum cereale) is not as easlily identified. In order to poperly diagnose this disease, it takes a little investigation and some time crawling around on the greens with a hand lens and camera. This not our first bout with this disease. As many of you will recall, we dealt with Anthracnose about this same time last year and were able to recover after some necessary applications of fungicides. ﻿ Typical symptoms of Foliar Anthracnose are a yellowing of the leaves starting at the tip and decaying downward as well as the presence of black acervuli on the leaf blade. 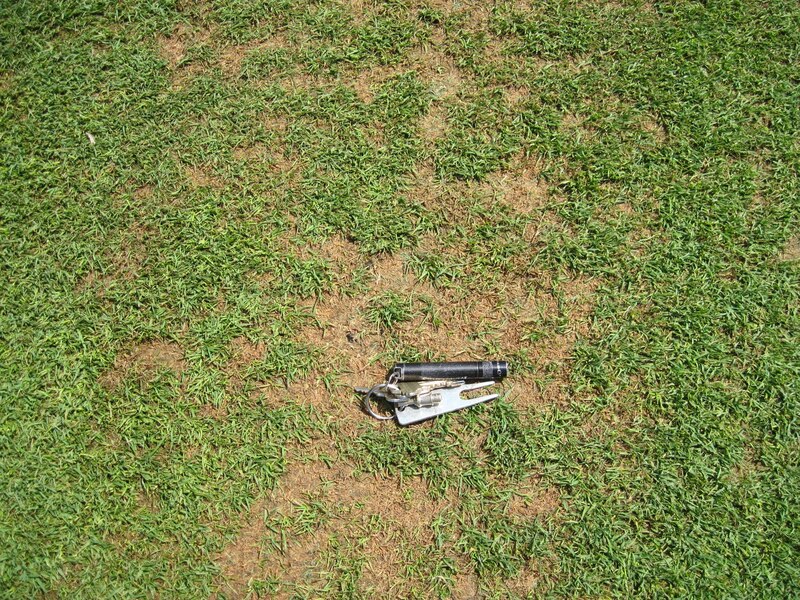 Damage can occur on both Annual Bluegrass and Creeping Bentgrass. 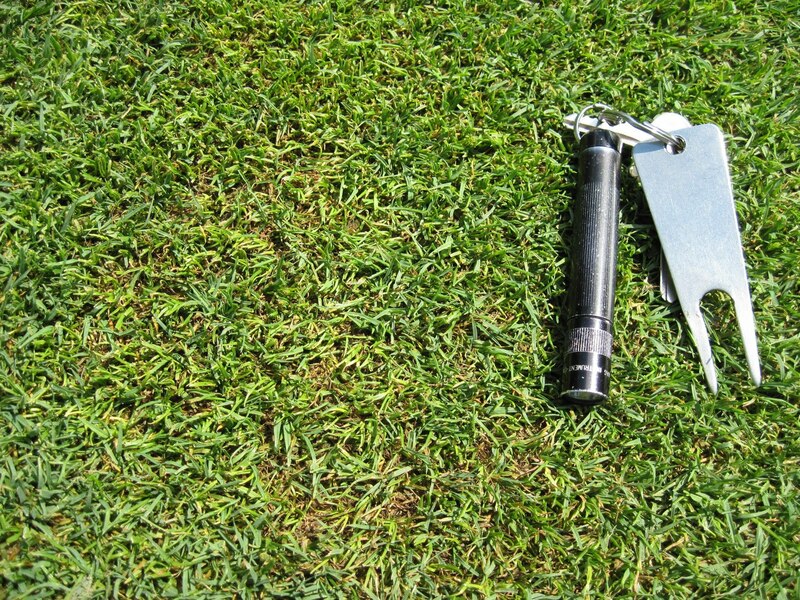 If left untreated, large areas of turf can be affected with the end result being a very inconsistent and undesirable putting surface. Acervuli and the associated bristlelike setae can be seen in the picture below that I took with my camera through a magnification lens. To see a larger version, please click on the picture. 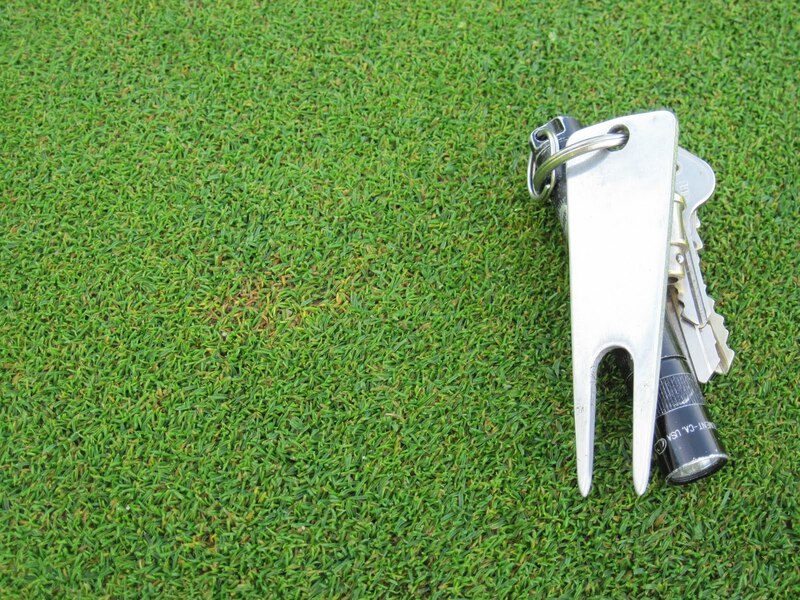 ﻿﻿Other than preventative applications of fungicides, recent studies have shown that a regular topdressing program as well as proper fertility can help to prevent this disease. 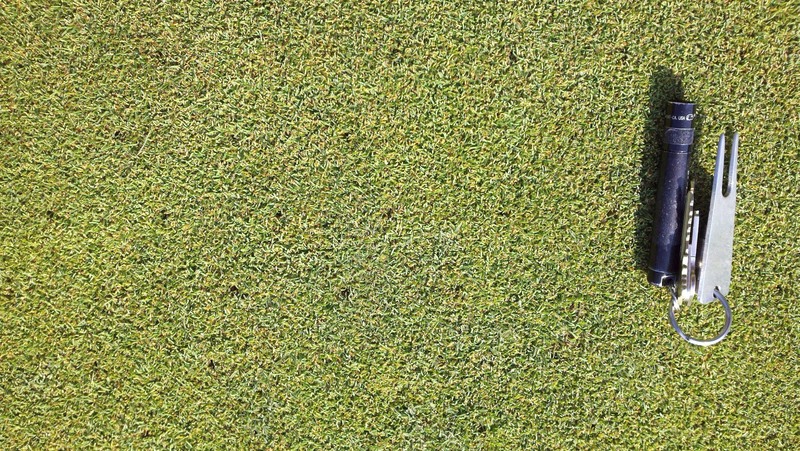 Nobody likes to deal with the greens being topdressed regularly or the increase in fertility levels which can lead to slightly slower green speeds, but a common ground can certainly be achieved while meeting realistic expectations. The fact that these two measures can help to prevent this disease speaks volumes of the importance of our management practices. Break out the Hiking Boots: The new trails are open! After a drive through our property to the far east of the clubouse earlier this spring, I realized we had the potential to grow our ever-expanding trail system even more. 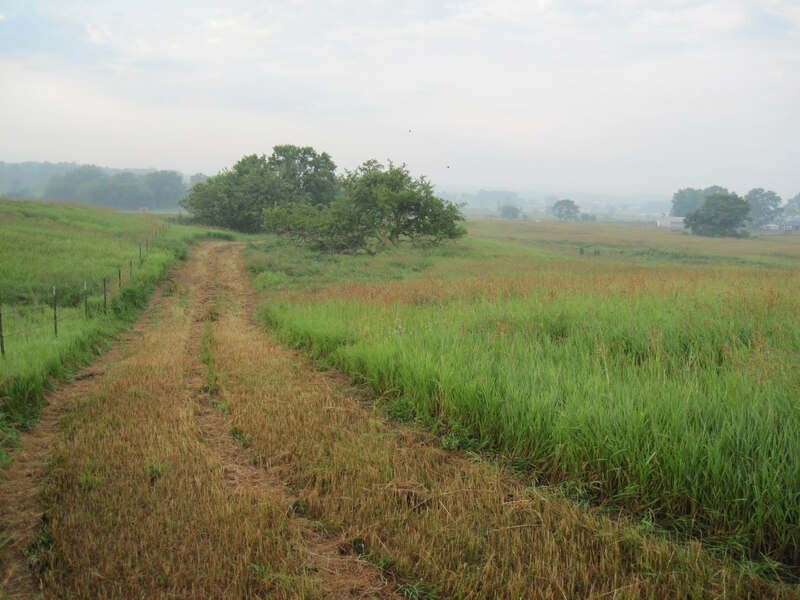 The new trails will take you around our fields that are leased for farming and allow you to access the highest point of the club’s property. The view to the south on a clear day is spectacular and I encourage all of you to take advantage of our beautiful surroundings. 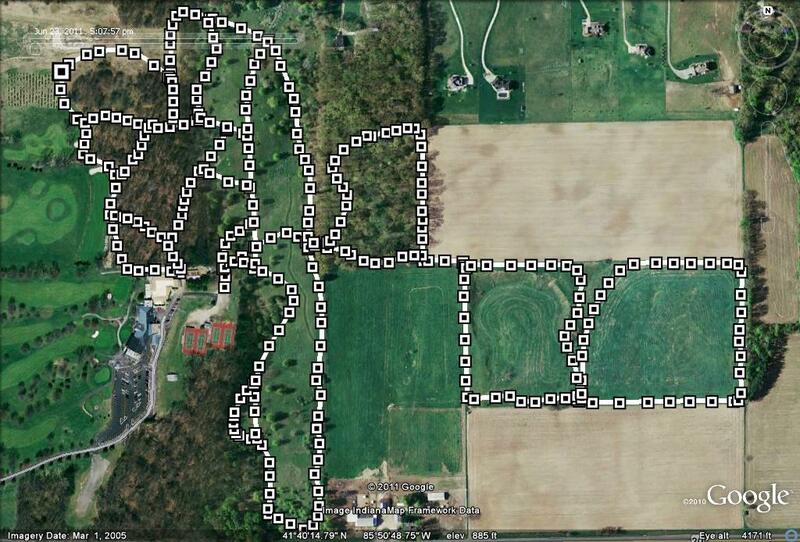 A new trail map has been made by using a handheld gps unit and is available at the clubhouse. 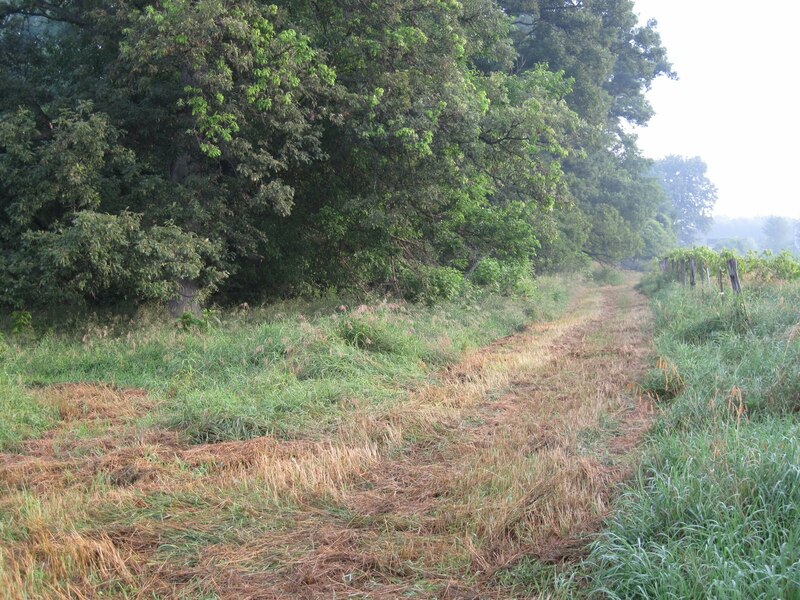 ﻿ ﻿﻿Elcona’s trails can be used year round for hiking, jogging, biking, skiing or simply taking your dog for a walk. Please remember: No motorized vehicles are allowed. During my inspection of the trails earlier this week, I was able to witness all sorts of wildlife such as: deer, turkey, groundhogs and several different species of birds. I’m quite certain that you will see the same thing on your tour. All totaled, our trail system now measures over 5 miles in length, but can be shortened depending on how many trails you choose to take. These trails are a tremendous asset to the club and only enhances our status as a member of the Audubon Cooperative Sanctuary Program.